John Kendall, and violin with David Cerone at the Cleveland Institute of Music, and received a BA in Music from Case Western Reserve in 1977. 2015 with the Reston Community Orchestra. playing, is my forte. Parents are welcome to observe lessons." 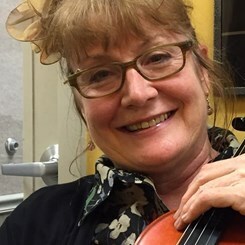 Request Lessons with Pamela Ferguson today!